Jurcisek, J. A., Dickson, A. C., Bruggeman, M. E., Bakaletz, L. O. In vitro Biofilm Formation in an 8-well Chamber Slide. J. Vis. Exp. (47), e2481, doi:10.3791/2481 (2011). The chronic nature of many diseases is attributed to the formation of bacterial biofilms which are recalcitrant to traditional antibiotic therapy. Biofilms are community-associated bacteria attached to a surface and encased in a matrix. The role of the extracellular matrix is multifaceted, including facilitating nutrient acquisition, and offers significant protection against environmental stresses (e.g. host immune responses). In an effort to acquire a better understanding as to how the bacteria within a biofilm respond to environmental stresses we have used a protocol wherein we visualize bacterial biofilms which have formed in an 8-well chamber slide. 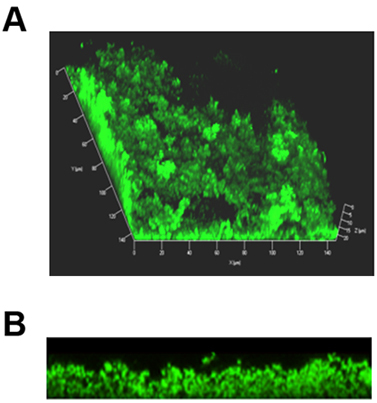 The biofilms were stained with the BacLight Live/Dead stain and examined using a confocal microscope to characterize the relative biofilm size, and structure under varying incubation conditions. 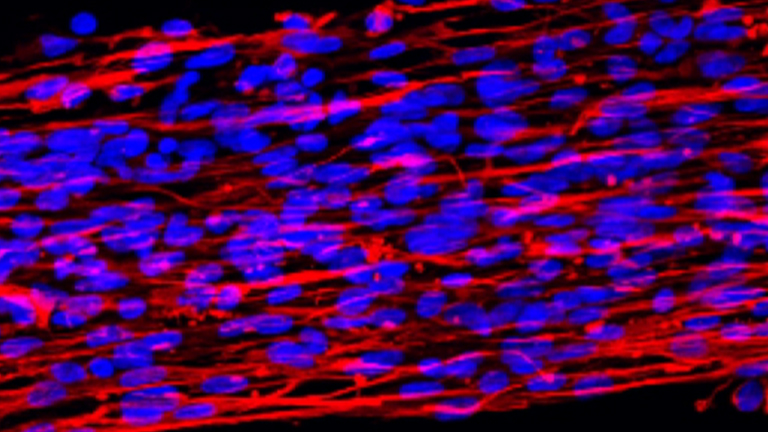 Z-stack images were collected via confocal microscopy and analyzed by COMSTAT. This protocol can be used to help elucidate the mechanism and kinetics by which biofilms form, as well as identify components that are important to biofilm structure and stability. The resulting bacterial suspension was then diluted 1:6 (1 mL bacterial suspension + 5 mL pre-warmed medium) and incubated at 37°C with 5% CO2 for approximately 3 hours in order to reach mid-log phase. Dilute the mid-log growth suspension 1:2500 with pre-warmed media and place 200 μL of dilution into each well of an 8-well chamber slide. Incubate at 37°C with 5% CO2. After approximately 16 hours, aspirate medium from corner of each chamber and add 200 μL fresh, pre-warmed medium - dispense along wall of chamber so as not to create shear forces within the chamber which could disrupt the biofilm. If incubating longer than 24 hrs, change medium every 12 hrs or as needed to maintain bacterial viability. Aspirate medium from each chamber, as described above, and wash resident biofilm twice gently with sterile saline. Add 200 μL of BacLight Live/Dead stain (3 μL component A + 3 μL component B per mL of saline) to each well and incubate at room temperature for 15 minutes. Protect culture from light from this point onward. Aspirate the stain and wash twice gently with sterile saline as before. Add 200 μL of neutral buffered formalin to each well and incubate for 30 minutes at room temperature to fix specimen. Remove fixative and properly dispose of in accordance with institutional guidelines. Wash twice with saline and dispose of the wash fluids that contain formalin as above. Remove the plastic wells from the slide, add enough saline to each well so that when a coverslip is placed on the gasket, no air bubbles are present. Coverslip and seal the edges of the coverslip with mounting medium. Nail polish can be used to seal the slides however the slides will not be as permanent. Allow the sealant to dry for approximately 1 hour prior to examining via microscopy. Figure 1. Representative 3D composite images of a biofilm formed in an 8-well chamber slide. Bacteria were labeled with Live / Dead stain wherein live bacteria fluoresce green and dead bacteria fluoresce red. (A) Composite image of entire biofilm showing distinct architecture with towers and water channels. (B) Same biofilm as in (A), now seen in cross section. Understanding the mechanism by which biofilms form, as well as characterizing their matrix components, is an area of intense interest. This protocol can be used to help identify proteins or other constituents that contribute to the structural integrity of the biofilm, as well as help identify and target proteins which may lend themselves to a therapeutic application. The incubation times and dilutions in the above described protocol have been established for optimal biofilm formation by nontypeable Haemophilus influenzae (NTHI). Some preliminary work may be needed to optimize these steps for other bacterial species (i.e. initial dilution and incubation time needed to achieve mid-log phase growth). The 1:2500 dilution for the initial seeding of the chambers was established to ensure that a robust biofilm would develop in the chamber slides as induced by this organism and within the incubation times stated, without the biofilm overgrowing the chamber and/or exhausting available nutrients. Accordingly, the initial dilution and or incubation times may need to be adjusted for other bacterial species. The work was funded by NIDCD/ NIH R01DC003915 to L.O. Bakaletz. Bakaletz, L. O. Bacterial biofilms in otitis media: evidence and relevance. Pediatr Infect Dis J. 26, Suppl 10. S17-S19 (2007). Heydorn, A., Nielsen, A. T., Hentzer, M., Sternberg, C., Givskov, M., Ersboll, B. K., Molin, S. Quantification of biofilm structures by the novel computer program COMSTAT. Microbiology. 146, 2395-2407 (2000).